I have not yet completed posting on the puffed rice recipes. But I have to do this post as I want to share with you something else. Recently I have been on a visit to Rayalaseema area of Andhra Pradesh- a very dry area, where climate is dry and very hot. Added to that they have scarcity of water. Ground nuts are major crop and are used very extensively in their recipes. However I am not going to talk about it here. I will post about it separately. On one of my walks in the evening, I came across some street vendors, selling roasted peanuts, salted peanuts, and fried and spiced lentils. I came across Sunflower seeds. 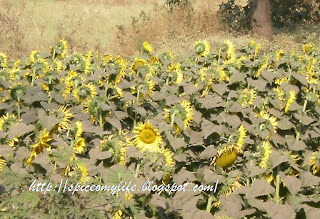 I know Sunflower seeds as I grow them in my garden, and I also know that Sunflower oil is being widely used in Indian homes as a medium of cooking, I was surprised to know that the seeds are eaten as a snack. Many people were buying a handful or two to munch along their shopping or walking. So I bought some...and they were very tasty. Here is a glimpse for you.. Here are the flowers. These are of small variety. There are also very huge flowers. I used to grow them. The flowers used to attract parrots in large numbers. I think they like the seeds. Now I have enquired around and found that the parrot feed contains these seeds as these are very healthy. These are the seeds. They have tear drop shape. Their husks are black or grey with black stripes. These seeds are small. I have seen bigger seeds. I removed the husks with my hands as I didn't have any other method. Here are the nuts inside. These are roasted and salted. They have mild nutty flavour and very tasty. They are also eaten with out roasting. But since they are high in oil content it is better to roast them before eating. Sunflower oil is extracted from these seeds. Today it is the most popular medium for cooking in Indian homes because of various health benefits. Sunflower seeds are the best whole food source of vitamin E. They contain around 90% of Vitamin E, which is an antioxidant and protects against heart disease . They also contain 30% of Selenium which along with vitamin E works as an antioxidant and protects cells from damage that may lead to cancer, heart disease, and other health problems. They also contain contain Manganese 36%, Magnesium 31%, Phosphorus 25%, Copper, Iron Zinc etc which are good for our health. Sunflower seeds are a good source of plant protein, which supplies amino acids, that build, maintain and repair body tissues. Sunflower seeds contain Folate or B vitamin for a good and healthy heart and Pantothenic acid, Vitamin B6, Thiamin and Niacin which give energy. Sunflower seeds and oil contain monounsaturated and polyunsaturated fat which lowers Low Density Lipoprotein (LDL) or bad cholesterol, and Triglycerides, maintaining beneficial High Density Lipoprotein (HDL) cholesterol, which is needed to carry the “bad” cholesterol away. Around 90% of the fat in sunflower seeds is good, unsaturated fat. They contain Fiber which help in easy digestion, lowering constipation and there by many diseases. However since these seeds contain high amounts of oil, and source of high energy level, one should consume them moderately as per their life styles. They are available unshelled where I saw but may be available shelled too. I have to enquire. In other countries shelled and unshelled are available. The shelled ones should not be yellowish in colour. Due to oil content these seeds turn rancid quickly. Few handfuls at a time can be put in small container of the Mixie and just on and off few times. This way some of the seeds might be crushed but many may be shelled. Pour the mixture into this bamboo kitchen aid which is available in all Indian homes known as Chaata in Telugu and Soop in Hindi. I don't know the English equivalent. 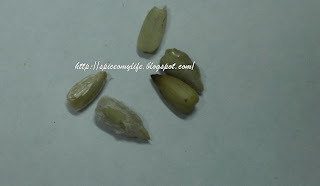 The crushed seeds are then tossed which throws out the husk and seeds remain back. 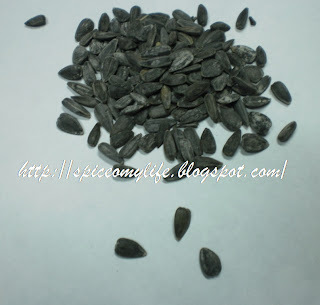 These seeds (with shells) can be roasted in a thick bottomed pan and then shells removed before eating. 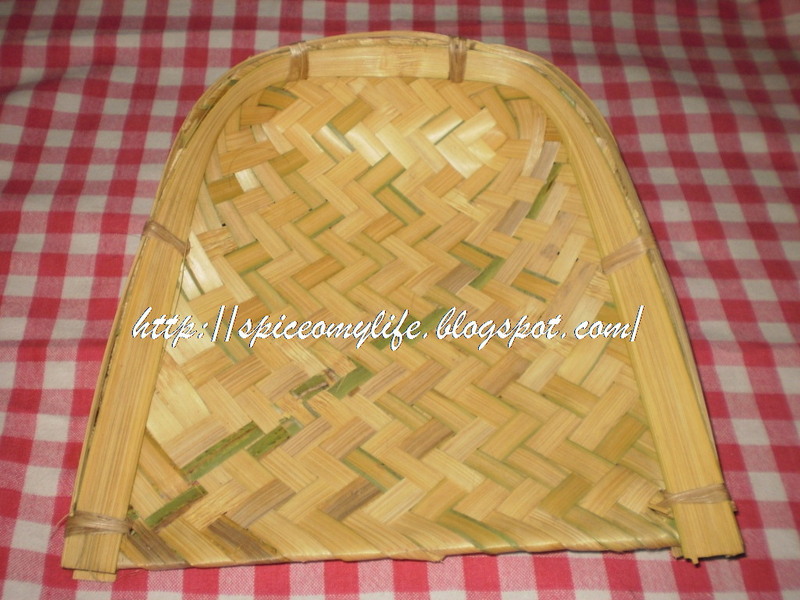 Traditionally in India, these are roasted over hot sand. While roasting them salt water is sprinkled to give them salty taste. These salted ones are easily available in Indian markets. Roasted one keep for a long time. A handful of roasted or unroasted and shelled seeds can be eaten as it is. These can be added to salads, sweets and desserts like halwa, burfi etc. Add these slightly crushed or whole to curries or chutneys. Chaata in Telugu and Soop in Hindi is called winnowing fan in English.